Reimplementing the algorithm with critical thinking over every procedure seems to be working well. Agents already avoid and push each other out of the way. And the best part – I know why they do so now. On the picture rightmost agent was staying idle and 2 agents from the left are on their course to walk to the purple dot. Each agent samples a square area in front of him (1024 points, for better debug display). Red shows where agent should not go (due to being off-way or on a course to collide with another agent). Green is preferred. White dot is the best way agent chose to go. Last edited by Krom on 19 Sep 2015, 20:10, edited 1 time in total. Problem with agents pushed into unwalkable areas seems to be fixed – instead of trying to keep the on walkable, wrote a “push back to walkable” function. Now to the next problem – pathfinding! Last edited by Krom on 19 Sep 2015, 20:09, edited 1 time in total. 40 agents so far. I hope engine will handle 400 on a bigger map.. keeping fingers crossed. will people be able to swim? Good news – work continues! Over the weekend I have successfully corrected the problem with two or more agents going for the same target and getting stuck, because no one had a clear priority over others. I have tried two different ideas and choose the best. Also greatly improved pushing out of idle agents. 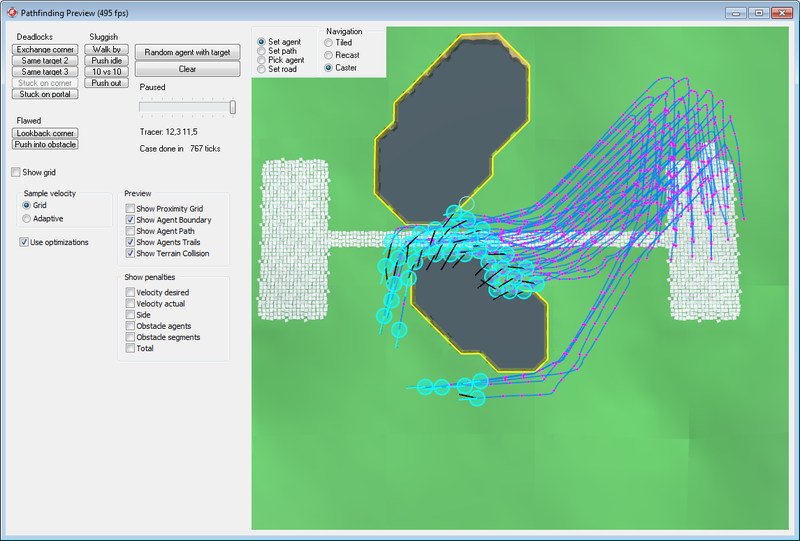 Changes and improvements were also made to other parts, such as pathfinding and selection of the next waypoint en route. Many additions were also made to the debug rendering, for easier isolation of problems and debugging. – In the narrow corridor agents often interfere with their neighbors, if they did not touch the waypoint while walking past it. Here the solution is already known – needs just implementing and debug. – Idle agents are much too “scared” sometimes. If some other agents approaches them and stops one tile short, they run back around 1/5 of tile. I still need to re think how to solve that, because this behavior is a part of the interaction and collision avoidance algorithms. It would be awesome if we could make a zone where idles head to.